Regular readers of this blog know I am a passionate supporter of our troops, both those who are fighting today and the many who've lost their lives in past wars and conflicts. I consider myself one of the fortunate ones who would give a completely different sort of answer to this poignant question. As a child growing up in the 60s I remember not only learning about the history of Memorial Day at school and what it was all about. I also recall my father raising the American flag in front of our house each year as well as attending memorial services to remember those who had served and sacrificed their lives in past wars. 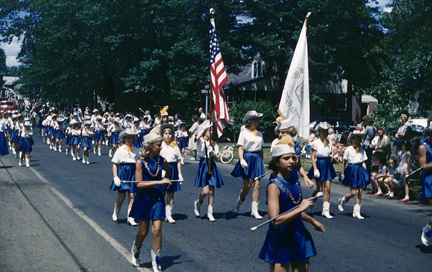 Finally, I recollect going to watch a patriotic parade that included men from our local VFW chapter marching by. Back then when I was in grade school this day of memorial was always marked largely as a somber but uplifting occasion on May 30th. It wasn't until 1971 when -- as dictated by a new U.S. law -- this Federal Holiday was permanently changed to the last Monday in May to create a three-day weekend. To this day, Veterans of Foreign Wars (VFW) and Sons of Union Veterans of the Civil War (SUVCW) still want to revert back to the original date. I tend to agree with these groups in that creating three-day weekends out of convenience is likely the reason why the younger generation no longer really understands the meaning of Memorial Day. Memorial Day was originally called Decoration Day. It was first observed by Freedmen (freed enslaved Blacks from the South) in Charleston, South Carolina in 1865 in memory of fallen Union Civil War soldiers. The first reference to "Memorial Day" was in 1882 and this gradually came to be the preferred name of the day. However, the observance did not become widely known until the end of World War II and the U.S. government didn't officially change the name to Memorial Day until 1967. The best way, in my opinion, to recapture the day's original semblance is to teach our children how important it is to honor the brave men and women who have served our country in the past, as well as those men and women who are actively serving. Also, we can't forget American military families as well as living veterans -- instead we need to support them and look to them for inspiration. Feel free to share additional ways you know about that help remind us all about what Memorial Day in America is really all about.